Your marina’s security might not be enough to prevent folks from stealing your marine equipment. NATIONWIDE — Plenty of ink in recent years has been spent on what boaters and marinas must do to rid waterfronts of abandoned vessels. If only we could quickly unload of those “eyesores” OUT of a harbor or marina, right? Rarely, however, is ink expended on the virtues of keeping perfectly functioning boats IN a harbor or marina, perfectly safe and secure from unsavory elements within the criminal world. An unofficial effort is afoot to raise awareness of – and hopefully combat against – a recent spate of marine engine and equipment theft from boats “securely” stationed in marina slips. It’s not quite a formal task force or coordinated effort but a smorgasbord of law enforcement agencies and private organizations are casually affiliating with each other to address news reports of people breaking into marinas in Florida, Texas and other states to steal outboard engines, navigational units and/or electronic equipment. Apparently criminals are circumventing security feeds and other measures to get to these recreational vessels, stripping them of valuable equipment. These items, speculatively, could be yielding major payouts on the black market. Amenities such as security cameras, fences and coded doors might not be enough to defend against this recent rash of outboard engine and marine equipment theft. Initial reports of such crimes occurred at marinas or boatyards in Florida, Texas and Virginia. Surely Southern California’s marinas aren’t (or won’t be) immune from such activities. Several questions come to mind in light of these recent news reports of marine engine and equipment theft. What could Southern California marinas and boaters do to protect against thefts of outboard engines and similar boating equipment? What items should boaters understand to be valuable enough to be targeted? Are such thefts becoming more commonplace? Is there any way of knowing what’s being done with the stolen items? What formal efforts are underway, if anything, to help address this problem? Maritime Program Group Claims Director Daniel Rutherford, an insurance professional who’s made an effort to inform and educate the boating public on marine thefts, said several items are being targeted by thieves, such as Garmin or RayMarine GPS/Chart Plotter Units and larger block outboards (mostly Yamahas). “For the smaller items, stainless steel propellers are a bit target because they are easily removed and are not easily traceable (no serial number),” Rutherford told The Log. Center console multi-engine boats are also high targets for marine thieves, Rutherford added. Thieves are also likely to target marinas with large boatyards or storage yards, whether or not they are fenced. The unofficial effort to address theft of marine engines and equipment hopes to find some answers. Though not a formal task force the national effort appears to be a cooperative affiliation of law enforcement agencies and private organizations. Details of the working group are not yet public, but BoatUS and Rutherford confirmed its existence. The working group – made up of certified marine investigators, multiple levels of law enforcement and private organizations – is urging recreational boaters to be vigilant about what’s happening at their marinas and harbors. Sunroad Marina general manager Jim Behun said his waterfront venue has a few layers of protection. The San Diego Harbor Patrol, for example, conducts a decoy program to monitor bicycle thefts at local marinas; a few people were caught in the act. An iWatch program, which encourages marina operators, boaters and anglers to pay attention to their respective surroundings, is also in effect. 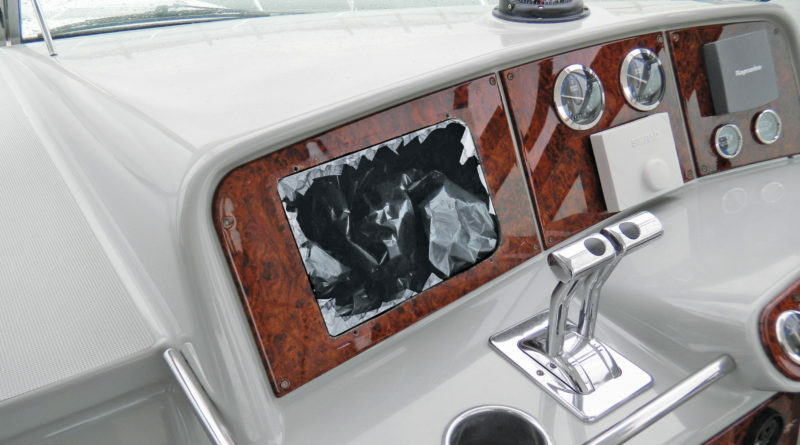 The marina, itself, requires use of a key to get in and out of the gate-controlled entries. Meanwhile dockmasters representing each marina in San Diego meet monthly and discuss any and all relevant activities occurring on the waterfront. Behun said boaters should practice as much common sense as possible when seeking to protect their vessels. Boaters should lock their boats, avoid hiding keys in obvious places, consider using a combination lock wherever possible and look into installing motion lights and/or cameras at their respective slips. Marine-related theft isn’t necessarily a new phenomenon, but there have been quite a few reports of outboard engines and electronic equipment being stolen across the United States and in the United Kingdom. Thieves in Washington State’s Skagit County, for example, reportedly targeted outboard engines in early 2016. An estimated $250,000 worth of marine engines was stolen from a boat dealership in South Carolina a few months later, according to news reports. Two men in New Jersey were reportedly charged with stealing $140,000 in marine engine parts back in 2013. Yachting & Boating World, a maritime publication in the United Kingdom, reported theft of outboard engines increased to 60 percent of all marine crimes in 2014. Thieves reportedly targeted 20-horsepower engines weighing about 125 pounds, according to the YB&W story. Such engines were easy to remove from the marina area and transport in the back of a truck or van. A separate news article published several months later stated marinas experienced a spike in theft of 350-horsepower engines (roughly 800 to 900 pounds in weight) in Hampshire, U.K.
Law enforcement in Hampshire, which is located near Southampton and Portsmouth in the southern edge of the United Kingdom, launch Project Kraken to monitor outboard engine thefts at local marinas. A coordinated effort to steal outboard engines between October and December 2015 was likely connected to a Lithuanian crime ring, Hampshire police reported. “We are dealing with a group of Lithuanian males who are highly organised and it would appear, maybe stealing to order,” Hampshire law enforcement stated in its January 2016 public newsletter. The newsletter identified six common themes local boaters should pay attention to when keeping a look out for potential culprits of outboard engines or marine electronic equipments. “The majority of incidents have involved more than one person (normally three) using a white transit sized van. The thieves have targeted secure compounds where large amounts of marine property are being stored,” Hampshire law enforcement officials stated. “The evidence we have secured suggests that these thefts are occurring at night – specifically in the early hours of the morning. The majority of thefts have been committed using vans with false plates fitted to them. Some marine manufacturers launched theft-protection products to give recreational boat owners a tool to defend against outboard engine theft. Yamaha, for example, introduced a command link function on its outboard engines. The theft deterrent system – Y-COP, or Yamaha Customer Outboard Protection – would disable the motor. Others have suggested placing a tracking device on outboard engines and electronic equipment. Rutherford added just about anything could be removed from a boat within seconds or minutes. The Log’s sister publication, Boating World, added outboard engine thefts can’t fully be stopped, but boaters should purchase insurance and take certain steps to protect and secure their vessels. BoatUS also offered a few practical tips to prevent marine engine and equipment thefts, such as installing bright lights and motion-sensors in the boat storage area, locking helm electronics behind a solid cover and installing some sort of tracking device. Also be mindful of people posing as customers or marina visitors during the day, as they might be scouts. Are they asking suspicious questions about access? Time will tell whether boaters will have a fully functioning national task force in their arsenal to combat marine engine and equipment thefts. In the meantime the best Southern California’s boaters can do is to not take anything for granted and take common sense steps to make sure their vessels are insured and secured. Is there a data base of recent thefts accross so. Cal. that can be accessed to see what areas are being targeted and what has been stolen? That would give us a heads up if we are in a “hot” area and should be more vigilant.